The company claims its spacecraft will venture to the Red Planet in the next decade. Elon Musk wasn't the only one dishing new details on a mission to Mars at the International Astronautical Congress in Adelaide, Australia. Lockheed Martin, which too plans to send humans to the Red Planet in the next decade, also dropped a bunch of new info about its ambitious project. The defense and aerospace company is currently building the command module for NASA's Orion spacecraft. The vessel will eventually make the trip to Mars carrying four astronauts, but it won't be alone. The shuttle will be attached to Lockheed Martin's Mars Base Camp (MBC) orbiting mission. And, on Thursday, the company laid out the design of the larger spacecraft, designated to carry crew, supplies, and scientific equipment. Along with a sleek Mars lander concept capable of carrying astronauts to the planet's surface from orbit. MBC will consist of four main sections and (according to Lockheed Martin) will come with "two of everything for back up." It will boast four large solar rays that will generate electricity to power the spacecraft. Propelling the vehicle will be two cryogenic propulsion stages, with two tanks to store the fuel (liquid oxygen and liquid hydrogen). What about the six souls stuck aboard the spaceship for 1,000 days? They'll be spending their time exercising, studying, eating, and sleeping in its two habitats and central living space. And, if you're looking for Orion, it will form the command deck (complete with the avionics for navigation and comms). "Orion makes the whole spacecraft more reliable, and gives the astronauts a safe ride home," explained Lockheed Martin in its video presentation. The company claims the initial crewed expeditions to the planet's surface will be "relatively short-duration, science-focused missions." In order to make the trip from MBC down to Mars, up to four astronauts will be able to hop into the company's reusable Mars Base Cape lander. The shuttle will use supersonic retropropulsion (the same approach used by SpaceX's Falcon 9 rocket boosters) in order to make the journey. Lockheed Martin claims that each surface mission could last up to two weeks without the need to return to the orbiting spacecraft for refueling. MBC will be dependent on NASA's recently-announced Deep Space Gateway at the moon. The orbiting space station will serve as a pitstop for astronauts on longer journeys. Whilst there, they'll be able to tinker with (and get accustomed to) the MBC spacecraft before deploying to Mars. 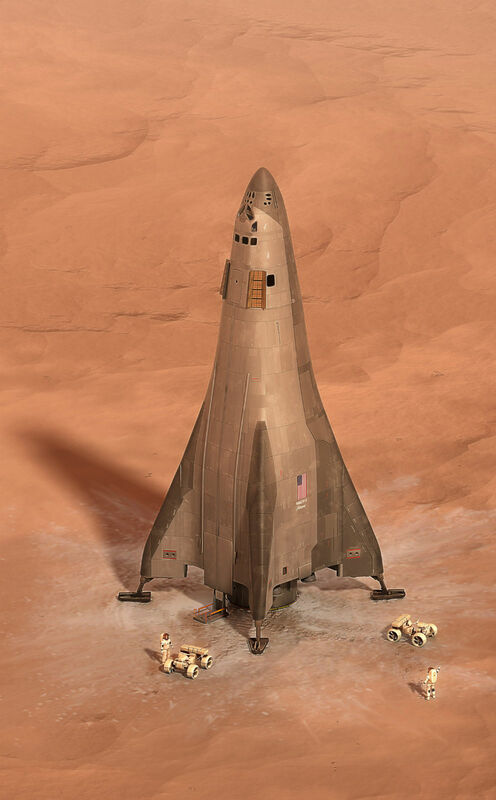 Lockheed Martin was one of six companies chosen by NASA to create a Mars habitat design as part of its NextSTEP program.